When entertaining, it is important to start with an inspiration that will drive your design. For this spring table setting, I started with the blush pink toned hurricanes from the Debi Lilly line, exclusively at Safeway. Hurricanes make great vases! 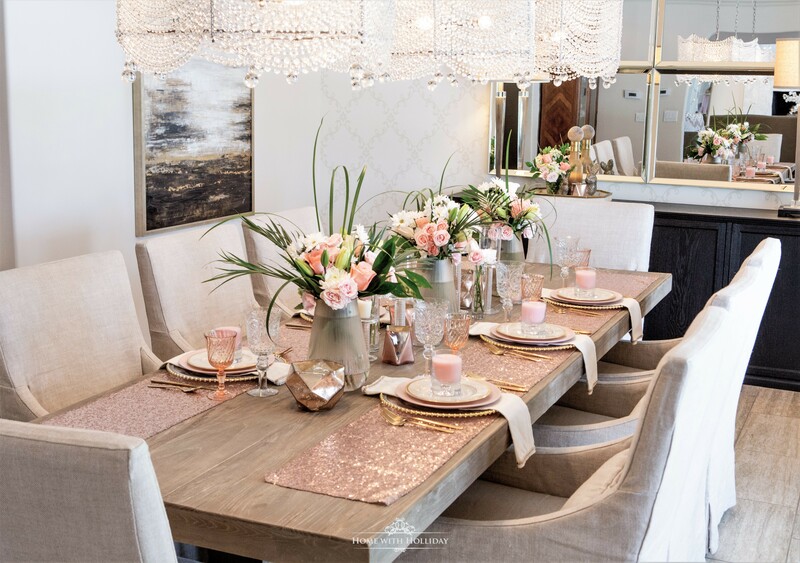 Since I started with the vases and knew I had plenty of tableware to create a blush pink table setting, I chose to use my blush pink sequined table runners as a base for the place settings. Part of my goal with this post is to show you how you can actually build a beautiful table setting with products from your local Safeway store. When I saw these gorgeous Debi Lilly glass chargers with gold beading, I knew they would be a perfect starting point for the place settings. They are neutral and so elegant. Plus, there are so many ways I can use these in the future! Using my gold flatware was a natural fit. The blush pink dinner plates (from Ikea!) anchored the layers with the simplicity they offer. Finally, my Lenox Tuxedo salad plates topped off the look. To top off the place setting, I selected these lovely blush pink candles as a party favor for guests. There is a perception out there that a centerpiece should include only one large flower arrangement. Our table is 10 feet long, so I enjoy spreading the flowers down the length of the table. Doing multiple smaller arrangements can provide some cost savings and also provide a nice amount of drama. For these flower arrangements, I used the pre-prepared fresh “Glory Bouquets”, by Debi Lilly as well. They provided a combination of white flowers and greenery. To tie in the flowers with the color palette, I simply purchased a few other bunches of blush pink roses and added them into the arrangements. It is OK for the arrangements to have a bit of a “messy” look. A little side note…even if your arrangements don’t need any more flowers, ALWAYS use all of your flowers! Use the “leftovers” to add a little more happiness around your table. Here are a few examples of some of the other Debi Lilly products that are carried in your local Safeway stores. The pricing and quality are excellent! I recommend visiting a few of their stores if that is an option for you as each store carries different products from the Debi Lilly line. I just love these table runners…only $4.99 each. Thanks for stopping by to see my Blush Pink and Gold Table Setting for Spring! I had so much fun collaborating with Eva from Super Safeway to collaborate using the beautiful Debi Lilly products from Safeway. Can you believe that so many of these items came from my grocery store?! Photos and video provided by Jennifer Rettig of Rettigandco.com. Holly, your table is gorgeous and I did not know that safeway carries this beautiful line of home decor. Can’t wait to check it out. Patti, I am confident that you will be pleasantly surprised! And, their prices are amazing! Thanks for stopping by! this is a gorgeous table Holly. Love the stunning runner, flowers and all your great tips. Love your style. Wow, wow, Wow….you did an amazing job Holly! I love the centerpiece arrangements with the spikey greenery added. Using the runners as an alternative to individual placemats at each setting is so creative. Thanks for sharing this at Homestyle Gathering! You have such beautiful style ans taste. I amazed at all the gorgeous that you can find at safeway. Very Impressive! Thank you so much, Meegan! 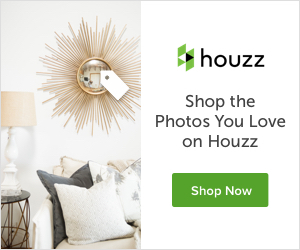 There are so many other amazing products to see there!